Toe In The Water, the charity which uses competitive sailing as a vehicle to re-inspire injured servicemen and women, is pleased to announce that it has accepted the generous donation of the Farr 52 racing yacht, Bob, which has featured prominently on the racing circuit in recent years. The current owners, Tony Hayward, Sam Laidlaw and Rob Gray, have given the yacht to Toe in the Water to support the tri-service initiative which was founded in 2008 and have personally pledged funds to get her into tip top condition for the forthcoming season. The Farr 52 will be used to provide injured service personnel, all of whom have been profoundly wounded, including loss of limbs, with the opportunity to sail competitively at the highest level. Working in partnership with Headley Court, the Defence Medical Rehabilitation Centre, Toe in the Water will be able to accommodate a broader range of injuries following the acquisition of the yacht. For the last four years Toe in the Water has borrowed or chartered boats to enter teams at challenging events on the yacht racing circuit and Major General von Bertele stressed that the charity had been careful to consider the risks and liabilities of taking on the ownership of such a major asset. “We have carefully considered the associated expenditure and are confident that we will attract the funding to cover the increased running costs. With this in mind we are ready to welcome additional partners on board to help us get the most out of this exciting addition,” Major General Von Bertele said. Formerly known as Bear of Britain, the boat has a long list of wins under her belt and was originally commissioned as the flagship vessel of an academy to develop talented young sailors. She was renamed Bob when she was purchased by Hayward, Laidlaw and Gray in 2009. Tony Hayward said that he and his fellow owners had decided to donate the yacht to help Toe in the Water run their programme helping injured service personnel see beyond their injuries. “We’re delighted to be able to support the work of Toe in the Water by donating Bob and hope that she proves a useful asset for such a worthy cause. She’s a fast boat with a fine racing pedigree and we’re confident that her Toe in the Water crews will continue to push her hard to deliver top results,” Hayward said. Hamilton added that the open layout of the Farr 52 with two central grinding pedestals will enable Toe in the Water to offer competitive sailing opportunities to service personnel with a wider range of injuries. “The good will and generosity that people show towards our Armed Forces continues to amaze me and their support for them through such acts of kindness is astounding,” Hamilton said. The boat will be renamed Toe in the Water at a ceremony scheduled to be held at the Joint Services Adventure Sail Training Centre (JSASTC) in Gosport, Hampshire on Friday 23 March. Following the re-naming, there will be no delay in putting the newly acquired boat to good use, as she will be putting prospective volunteer crew through their paces the very next day at the charity’s annual crew selection weekend. Over 170 people, mainly serving soldiers, sailors and airmen and women have expressed an interest in becoming crew volunteers for the upcoming season and a rigorous selection process on 24-25 March will identify the people who will sail alongside the injured crew in 2012 at the RORC Easter Challenge, the JP Morgan Asset Management Round the Island Race, Aberdeen Asset Management Cowes Week and the Garmin Hamble Big Boat Series. Record breaking round the world sailor, Dee Caffari MBE, said she is looking forward to attending the naming ceremony of Toe in the Water later this month. "I'm proud to be an ambassador for Toe in the Water and I've been able to see first hand the positive impact that being back in a competitive environment can have on severely injured service personnel. 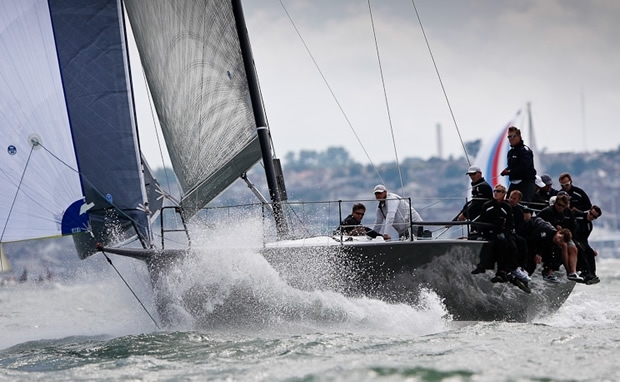 Farr 52s are seriously exciting boats to sail and I know it will make a massive difference to the rehab of the extraordinary guys who sail with Toe in the Water to experience the adrenalin rush of racing on such a fast boat."